Halloween is nearly here, and Guts is already preparing the scary decorations! You can join in the spooky fun this week in their Leaderboard Race and get the chance to win a share of €6666 bonus money, with a top prize of €1000 for the first place and €666 for the second place! You can also win free spins every day! You get 15 points for each €1 wagered in the Guts Exclusive Live Roulette or the slots listed below, most of which are a little spooky. Every player that earned 150 or more points on one day will be entered in a draw to win free spins the next day. You get the chance to win the free spins every day of the promotional period. 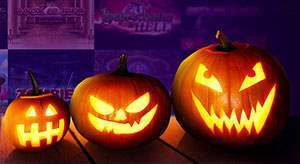 111 players are drawn from the pool and get 6 spins each, for the slot Happy Halloween with a spin worth €0.50. If you win free spins you have to claim them within 48 hours, otherwise they will expire. The final prize draw will be held on November 1, 2017, and the winners will get their funds credited at 3pm. Terms and conditions apply. Good luck! More information about Guts Casino is available in our detailed review. Join the Halloween Race at Guts Now!